I’ve been messing around with noodles in the thermal cooker and I haven’t had awesome luck. If you keep them in the thermal cooker for the entire cooking time, they get swollen and mushy. If you add them for the last 30 minutes of cooking time, they get soft but also kind of gluey because the liquid is no longer actually boiling. Putting noodles to cook in hot but not boiling water is apparently a no-go. Since I knew I was doing a spaghetti sauce recipe today, I thought I’d give noodles another try. The trick here is to cook the sauce as listed below. When there are maybe twenty minutes left until dinner, bring water to boil in the small inner pot. Add your noodles and boil for a minute or two. Then insert the small inner pot into the cooker with your spaghetti sauce that’s already been cooking for hours. Seal the cooker and let the noodles cook for the amount of time the package directions specifies. Then, what’s the point of using the thermal cooker to cook noodles this way. For one thing, you save a little energy by not having to boil the noodles the whole time. It’s also a convenient way to take dinner on the go. As you’re leaving the house for baseball, put the noodles in and then dish them up on the field. Now for the sauce. 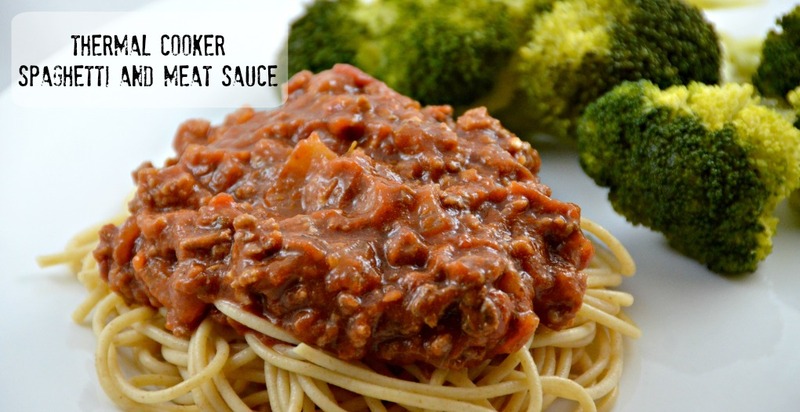 This is an amazing sauce that can be modified a hundred different ways. The basic recipe was taught to me by my Peruvian aunt who was living in Montreal. She taught me how to cook this, while speaking French and with no exact measurements. She just tossed things in the pot and I tried to write down approximate amounts. I’ve been making this sauce for nearly twenty years now and it’s a little different every time. So, make it your own. Heat oil in skillet and toss in onions. Stir the onions for about 5 minutes until they are translucent and begin to turn golden. Add ground beef or turkey and stir and break into small pieces until most of the pink is gone. Drain most of the fat. Then add garlic and spices and stir for 30 seconds. Dump in tomatoes, tomato sauce, tomato paste, marinara, and bullion. Bring to a boil for 3 minutes. Stir in sugar. Place in the thermal cooker and seal. Let cook for 1-4 hours until you’re ready to eat. Serve over noodles or vegetables and top with parmesan cheese. Heat oil in skillet and toss in onions. Stir the onions for about 5 minutes until they are translucent and begin to turn golden. Add ground beef or turkey and stir and break into small pieces until most of the pink is gone. Then add garlic and spices and stir for 30 seconds. Dump in tomatoes, tomato sauce, tomato paste, marinara, and bullion. Bring to a boil for 3 minutes. Place in the thermal cooker and seal. Let cook for 1-4 hours until you’re ready to eat. Serve over noodles or vegetables and top with parmesan cheese. Thermalcookerrecipes.com provides recipes as a resource and educational tool only, and makes no food safety guarantees. We are not liable for any failure to meet food safety standards that may arise in your thermal cooking. We make every effort to ensure that our recipes meet established food safety standards. But all thermal cookers are not created equal, and there are many variables at play resulting in the temperatures reached and maintained in your thermal cooker. Always follow the manufacturer’s instructions for your specific brand and model of thermal cooker, even if that means tailoring our recipes. If you are in doubt, please consult the FDA page on foodborne illness for safe cooking temperatures and other safety tips. And use a food thermometer to ensure that your food has been cooked and stored at a safe temperature. Disclosure: This post may contain affiliate links. This means, we may receive a small commission if you choose to purchase something from a link we post. Don’t worry, it costs you nothing. Thank you for supporting our website! Buy Your Saratoga Jack Thermal Cooker Today! These are affiliate links. 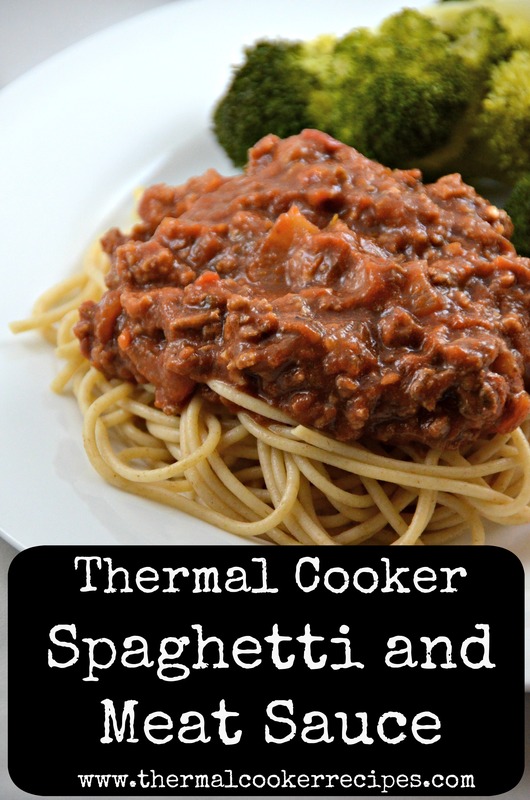 You help support our site when you purchase your thermal cooker products here.